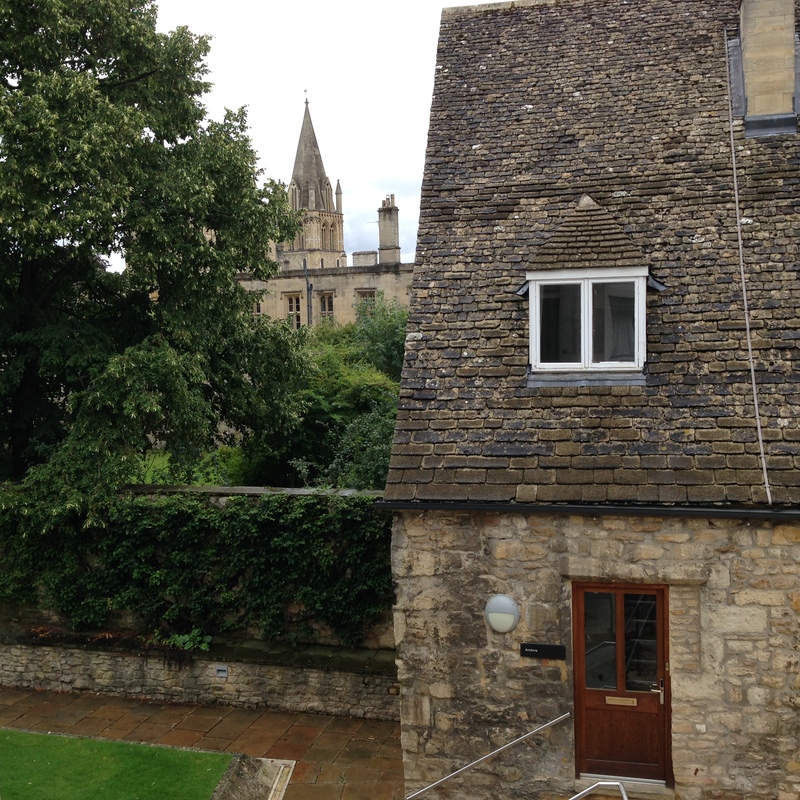 The view from my room at Christ Church, University of Oxford. Christian Faith and Modern Thought: Are they incompatible? C.S. Lewis and the Christian Imagination. 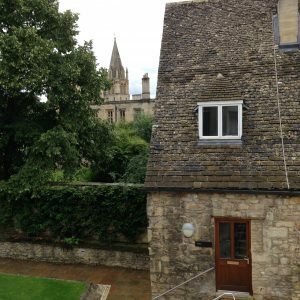 Since this is the 500th anniversary of Luther nailing his 95 Theses to the Wittenberg church door, the beginning of THE Reformation, the Summer School theme is Reformation: Reform and Renewal in Christian Life and Experience. There have been many reformations in the church over the millennia, and the question is, Are we in need of another reformation? This is a timely question, and the opportunity to study up on how the church has historically dealt with upheavals of various types might be instructive for us today. How has the church decided what to hold fast to, and what is cultural and can change or adapt? Monday was the first day of classes and I’ll just give some key ideas and impressions. Of course, these are provisional ideas because they will all be developed over the next four days. The Catholic Church’s response to Luther was way too long-delayed to have any hope of healing the relationship with the Reformers. They waited 28 years before holding a council to address the issues, and then the Council of Trent took another 18 years to decide what the response should be! Forty-six years is a long time to formulate a response to a crisis! By then the horse was out of the barn and there was no returning. This made me think of the need for the church today to respond quickly to the issues of our times. If we don’t respond in good time, then the world will just pass us by. And when we do finally respond, it will be too late. The Roman Catholic church did make a surprising number of the corrections Luther had called for. Incidentally, it was from the time of the Reformation that the Catholic church became known as the Roman Catholic church, a far more accurate description of what it really is than just Catholic alone. This course is promoting faith while critically assessing religion (the institutional structures of the church). It was heavily philosophical today, and I’ve never taken a philosophy course, so this is all heady stuff for me. Plato and his student Aristotle disagree with one another. The dichotomies between them have never been resolved, leaving everyone frustrated. Dominicans, such as Thomas Aquinas, follow one, and Augustinians, such as Martin Luther, follow the other. And that’s why Luther disagrees with Aquinas. The question is, Can we live with the tension between different philosophies without having to synthesize them? Philosophical Theology starts with theological reflection and then uses philosophical concepts as a servant to theology to help explain it. In essence, Biblical theology rules. Theological philosophy does the opposite. Biblical theology is tested against philosophy and when the two are incompatible, philosophy rules. As I read the four textbooks for this course, I had a major “Aha!” Conservative Protestants use Philosophical theology while liberal Protestants use Theological philosophy. A little knowledge is a dangerous thing, and I wonder what a real philosopher would make of my little, but for me anyways, significant insight! René Descartes messed everything up with his “Cogito, ergo sum” idea. Everything we experience in society today can be traced back to these three words. What “I think, therefore I am” means is that the only truth there is, is inside us. There is no objective truth ‘out there’. You can have your truth, and I’ll have mine, and they’re both equally valid even if they cannot both be objectively true! To me, Descartes’ thinking can have bizarre implications. Here’s an example: In the class, there was a projector on the table, and eighteen people in the classroom. How many projectors are there? This is not a joke! Descartes would say there are eighteen projectors because we all see the projector differently, each from our own perspective. The ‘imp’ in me thought, “Okay then, I’ll just get up and take my projector out of the room and leave the other seventeen projectors for them to use! Then we’ll see how many projectors there really are!” Fortunately, the wiser person in me did not say any of that out loud! But back to serious business. Subjectivism and individualism are the natural consequences of Descartes’ philosophy. The professor stated that we need to transcend Descartes, but that no thinker has yet toppled him. There needs to be a better way to think, he says, that draws us back into community. However, there is no quick fix to the way society thinks today. If Descartes is ever overcome, it will be a long time before society is transformed once again. So there’s some food for thought for you. Hope you enjoy ruminating on it.